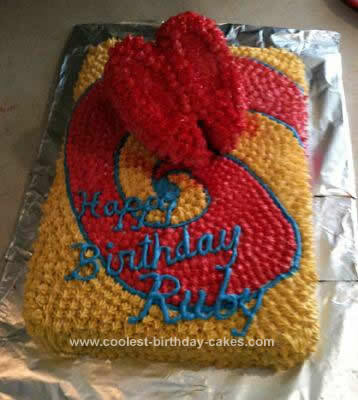 I made this Homemade Dorothy from Wizard of Oz Red Slipper Birthday Cake for my daughter Ruby’s 3rd birthday. She loves the Wizard of Oz movie and has a complete Dorothy outfit (which she wore to her party). I made it from a homemade pound cake so that it would be dense enough to sculpt and stack. 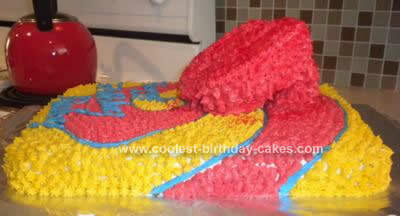 The base is a standard 9 x 12 cake. The ruby red shoes are sculpted from a 10″ round (could use smaller). I cut the top of the shoe in one piece and then two small squares for the heels. I iced both and refrigerated overnight so they’ be easier to place. I iced with stars and then sprinkled a red glitter over the shoes (made by Wilton). 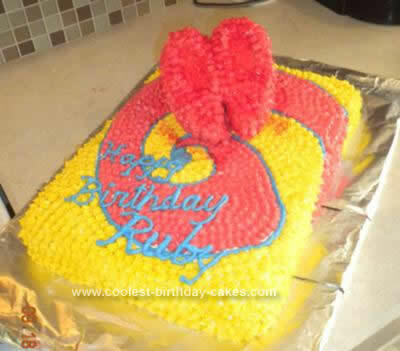 It turned out great and Ruby was so excited!